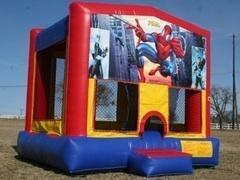 We are featuring a spider-man bounce house rental. This is a 15x15 bounce house rental. This is a must have for any Spiderman themed Birthday party or event. Our Spiderman bounce house features a spacious bounce area, basketball hoop and safety ramp. Look at spider-man swing into action to stop all villians in their tracks. This bounce house is bright and colorful and sure to be the hit of your party. Great for entertaining the children at an adult event or being the center of attention at a birthday party. Lots of room for the kids to bounce, jump, play and also shoot hoops as this bounce house has a basketball hoop on the inside. Don't be a villian be sure to check out our cotton candy machines.